I remember a time when this place used to be California Pizza Kitchen during my college days in Irvine. In fact, the complex has been totally revamped with new hip and up and coming restaurants(including the soon to be Lady M Boutique). It's a fairly busy place with tons of parking throughout. North Italia is actually a reasonably large restaurant. The interior is rustic, with a simple and casual feel to it. There is a sizeable bar area for those who would want to grab a quick bite and a drink. 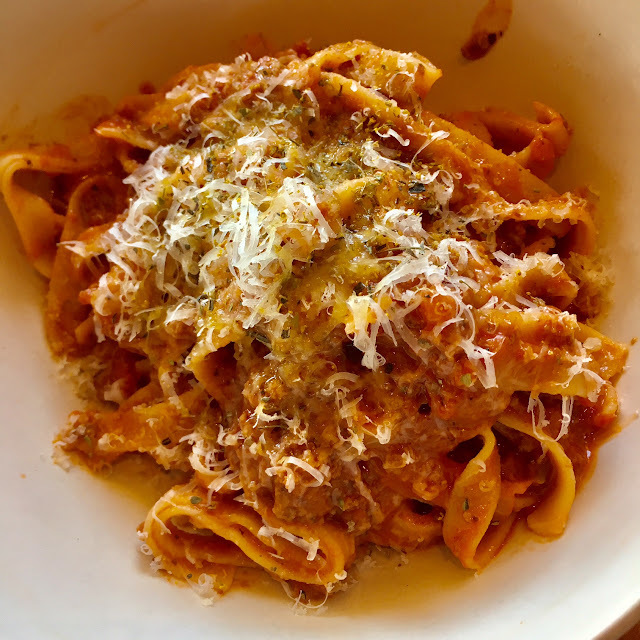 BOLOGNESE (HOUSE SPECIALTY-$19.00): Traditional meat sauce, Tagliatelle Noodle and Grana Padano Cheese. I actually really loved this dish. I thought it had a lot of flavor put into this meat sauce. It felt like it was cooked for many hours and the flavor was on point: rich, hearty, and filling. I think this is a must order if you like red sauce. 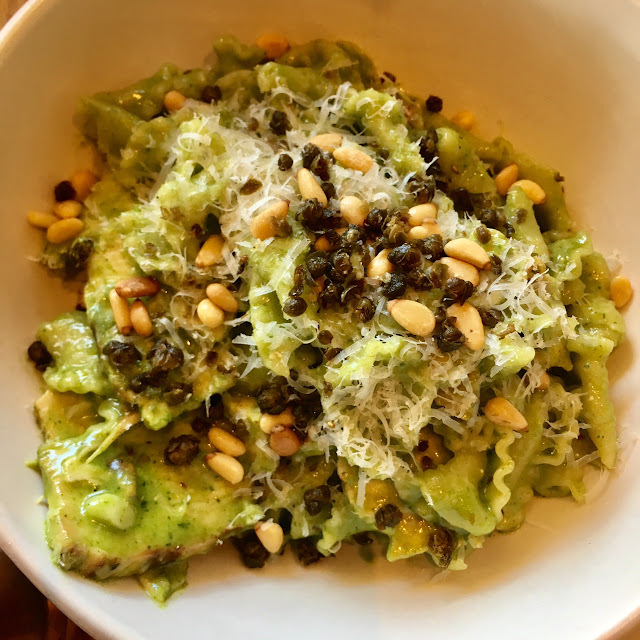 CHICKEN PESTO ($17.00): Gigli Pasta, Toasted Pine Nut, Crispy Caper. This was delicious. The pesto coated the pasta really well. It didn't taste too heavy and there was a bit of a lemony flavor to the pasta. Good dish overall. MY FAVORITE DISH. 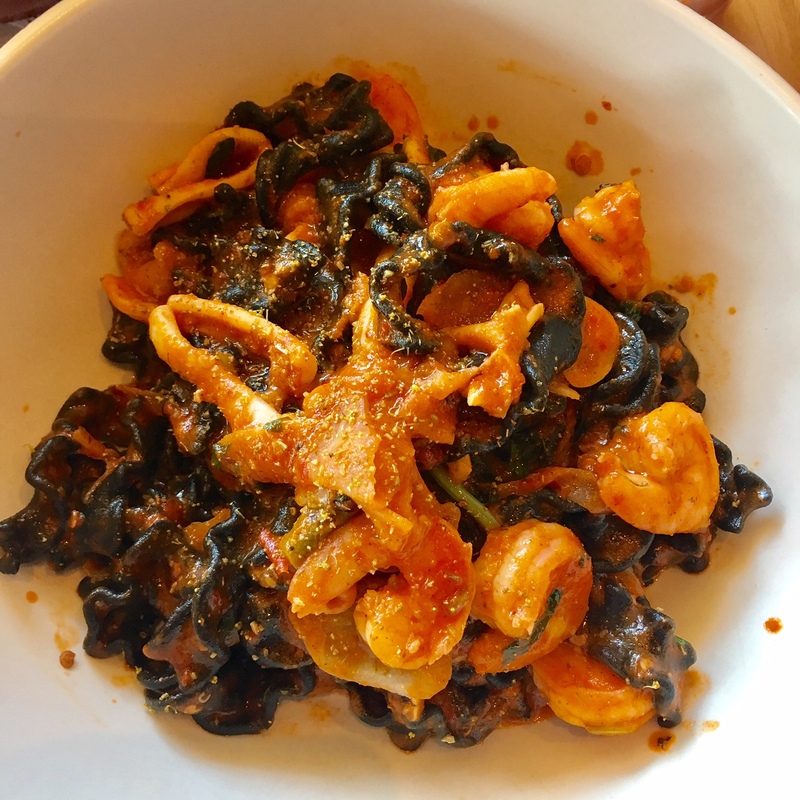 SQUID INK MAFALDINE ($22.00): White Shrimp, Calamari, Acqua Pazza, Mint, Fennel Pollen, Calabrian Chili. Ok, so when it comes to seafood pasta, I'm extremely picky. I don't like the pasta to be too fishy or "seafoody" if that makes any sense. I loved this pasta. It wasn't fishy at all! It had a bit of spice from the chili and the pasta was perfectly al dente. The sauce was a light tomato sauce and everything was perfect. Definitely order this if you love seafood. SHORT RIB RADIATORI ($21.00): Parmesean Cream, Fresh Horseradish, Wilted Arugula, Herbed Breadcrumb. This was actually not as heavy as I thought it would be. The cream sauce was on the lighter end. 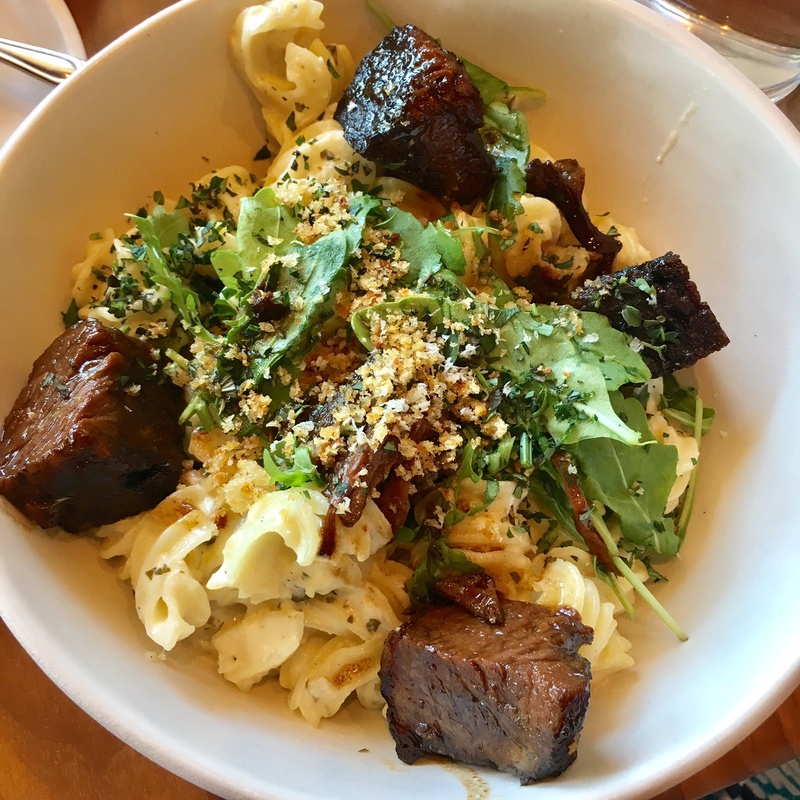 The short rib was actually nice and tender. If you like cream sauce and meat, you'll love this dish. 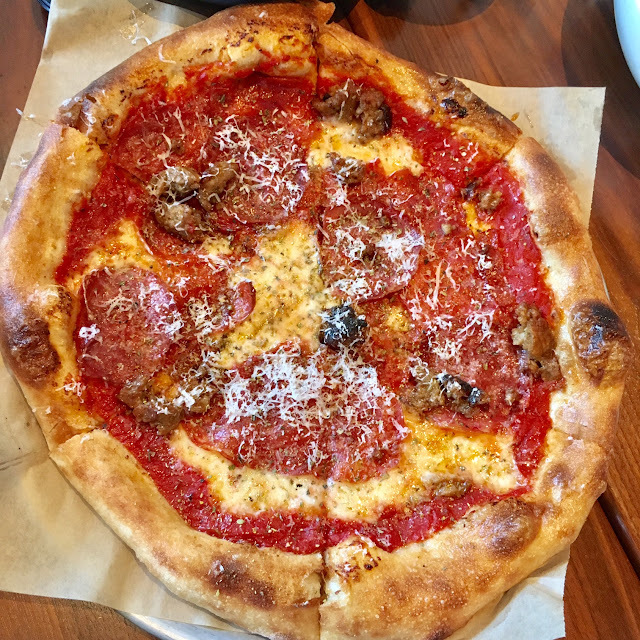 THE PIG ($17.00): Spicy Pepperoni, Soppressata, Italian Sausage. The pizza was actually pretty darn good. The crust was thin but held up well to the toppings. The sausage gave the pizza a little kick. I loved the tomato sauce that went with the pizza: slightly sweet and robust. A pretty good pizza overall. 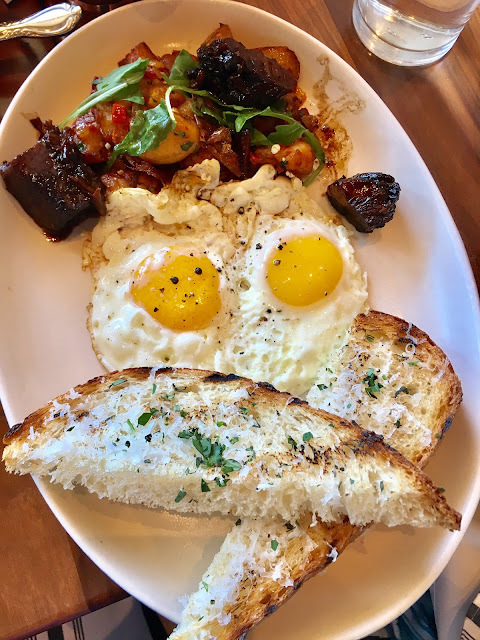 SHORT RIB HASH ($16.00): Sweet Onion, Roasted Pepper, Two Fried Eggs, Grilled Bread. This was pretty good. The ash with potatoes were delish and the eggs were perfectly fried. Together, they tasted amazing but apart, they were just good. I thought the bread was a little too dry. Overall, I thoroughly enjoyed North Italia. The food was on point with balanced flavors throughout each pasta dish. There is a private room at the Irvine location that seems to be a good spot to hold a small gathering. There are multiple locations throughout the US and one other location in El Segundo. It can get pretty busy so reservations are recommended.